Salt definitely makes food better, but its excessive use can harm health. The American Heart Association (AHA) recommends eating about 1,500-2,400 mg of salt daily, but apparently, Americans consume an average of 3,400 mg daily and most of this intake is a result of the consumption of processed products. Such high amounts of salt raise the risk of health issues. The New England Journal of Medicine released a study which found that globally, about 1.65 million deaths are a result of the unhealthy sodium consumption. In America only, 10 percent of all heart-related deaths occur due to excessive sodium intake. High salt intake raises the risk of hypertension, as the heart is forced to pump harder due to water retention. This adds more strain to internal organs and leads to heart disease, stroke, dementia, and cardiovascular disease. Sodium leads to water retention, and swellings that occur in the hands, feet, and legs, as well as chronic bloating. The body loses calcium through urine, and the more salt you consume, the more calcium you lose. The lack of calcium in the body leads to weak bones and osteoporosis. 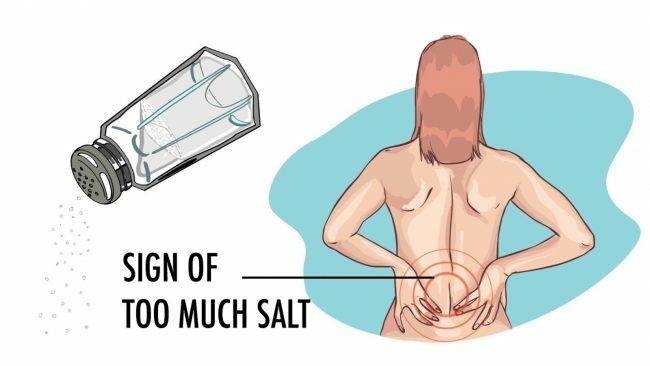 Sodium raises the risk of kidney stones as it increases the level of calcium in the urine. 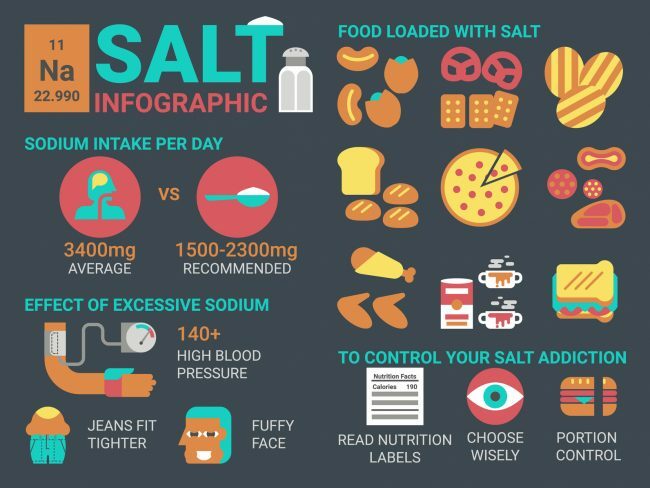 High salt intake leads to water retention, and as kidneys remove less water, one develops high blood pressure. This leads to kidney failure as the blood pressure affects arteries that go all the way to kidneys. Excess salt can cause cognitive impairment. The Neurobiology of Aging published a study in 2011, which showed that the excessive consumption of salt can lead to cognitive decline, and brain fog is one of the early signs of it. According to Stephanie Dunbar, registered dietician, director of Nutrition and Medical Affairs at the American Diabetes Association, researchers have proven that if everybody reduced sodium in their diet, the rates of heart disease in the United States would drastically go down. Salt has been used for hundreds of years as a preservative, and due to its low price, most food makers use it as a flavoring these days. It is much more expensive to use other herbs and spices to make food taste better than to add salt. Moreover, it is not easy to cut out sodium, considering our current food production it’s very difficult to cut out sodium. For instance, a slice of bread can have 250 milligrams of sodium alone. Therefore, one needs to avoid all kinds of canned and processed foods, which are extremely rich in salt, in order to be able to reach that recommendation.